My recent tour to Phuket was focused on exploring the small islands around the place. I have been to Phuket in 2010 by the recent trip was simply amazing. 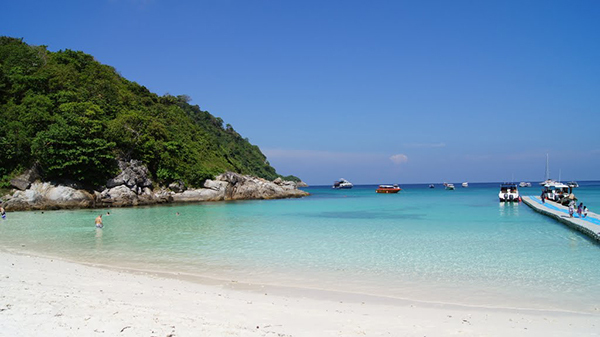 One of the memorable times of the tour was a day spent on Racha Island or Raya Island as indicated by one of the locals. Getting a long tail boat to get you to these small islands around Phuket is a common practice and you can easily get to the Racha Island by the same means. The beautiful white sand beach with sparkling clear and calm blue water touching your feet is the exclusive part of the island. There is so much to do on the island and I am sure you will have an adventurous and exciting day at the Island. Phuket and some popular Islands around have been the main destination for tourists since years and has become a little crowded. On the other hand Racha Islands provides you the peace you have been looking for along with the exciting water activities with less traffic of tourists around. Snorkeling, Scuba diving, Snuba, or simply a relaxing swim; you name it and Racha Island has it all. It is also known as the “Divers Paradise” because of the clear water, ideal depth, natural topography and physical layout of the Island. Enjoy the miraculous marine life while snorkeling or go for Scuba diving as this is definitely one of the ideal places to dive in. If you are with family that chose the option I went for, that is Snuba which easily combines the amusement of snorkeling and provides you with the diving excitement. To be on the safe side, make sure that the guide offering you Snuba services is licensed. Special swim areas are marked for an undisturbed experience of a relaxing swim in the clear waters and some local restaurants near the bay offer scrumptious food to the visitors. You will also find some upscale restaurants offering you 5 star menus along with the coconut water stalls on the sideways. My day at Racha Island was full of adventure and I advice an all day trip to Racha Island for a relaxing yet exciting diving experience with your family and friends. I was there a year after the big Tsunami, they did a great job on cleanup, even tho it was devestated. Anyways, it’s a beautiful place!